This comprehensive collection of Surgical Pathology Seminars (1945 to the present) comprises digital images of original slide material of nearly 20,000 cases originally presented at approximately 1500 pathology seminars. The collection includes clinical history summaries, discussions, and diagnoses by yesterdays authorities with updates and comments by Dr. Rosai and other contemporary experts. 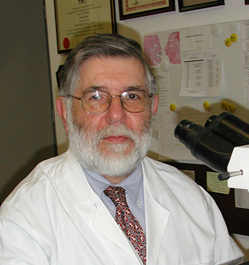 Pathologist spanning the globe can access the collection to learn about the evolution of surgical pathology thinking, as described and discussed at pathology society meetings, individual medical centers, and pathology groups over the past 60 years. Juan Rosai makes freely available to the International pathology community the digital version of this historical collection through a partnership with the USCAP and Aperio. Seminar 122: , INDIANA ASSOC PATHOL, 19? ?